Carousel Coral: Top 5 Face Masks. Hello my lovelies! Today I'm going to talk to you about my top favorite face masks. I rarely do skincare posts and that's because I keep changing my skincare products quite often but when it comes to facial masks I'm loyal. Using a face mask it's not something that I do often, it depends on what skin problems I have at that period, such as oiliness, blemishes and dehydration. But there are times that I want to use a face mask on the days when I just want to pamper myself. All of the masks I'm showing in this post are from greek brands and to be honest I'm very proud of that, I think that greek brands have the most amazing face masks I've ever tried and the fact that they come in small sizes is even more awesome because I like to switch up the masks that I'm using and also they're travel friendly. I've been using the Apivita face masks for many years, their quality is exquisite, I've tried almost all of them but only two are the ones that really stood out for me. 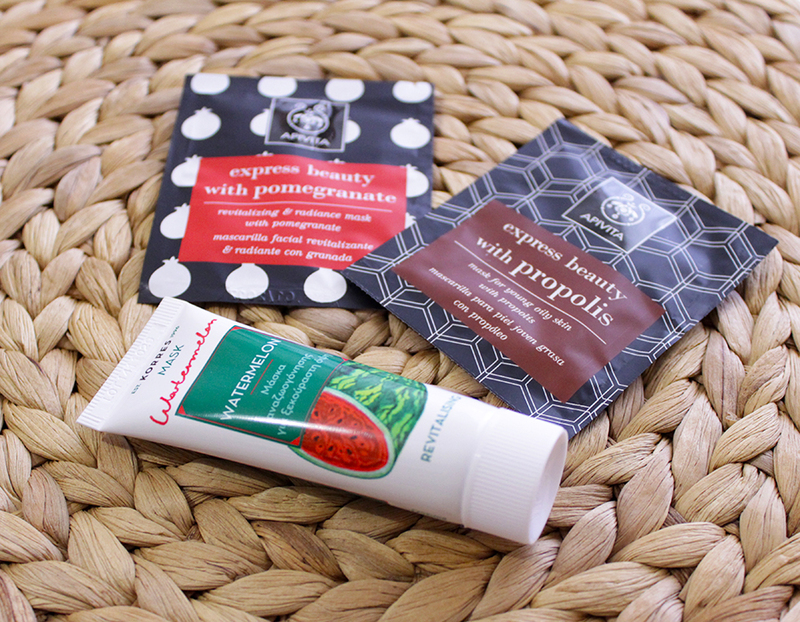 The Radiance face mask with pomegranate is the one that I love using when my skin looks dull, it only takes 15 minutes for my skin to look more awake, fresh and plump. It contains pomegranate extract and vitamins C & E that rejuvenate and offer antioxidant protection, it also contains shea butter, organic honey extract and hyaluronic acid that moisturize and nourish the skin. The Purifying face mask with propolis is the one that I'm using on the days when my skin is quite oily and have blemishes, I have to say that it works wonders, it dries out any blemish I may have within a day. It contains propolis tincture with antiseptic and antibacterial attributes, it also contains medicinal Heilmoor clay that balances oiliness and prevents acne, and it contains panthenol which provides softening action. Something that is worth mentioning is that Apivita has replaced water with organic green tea infusion for its antioxidant action. 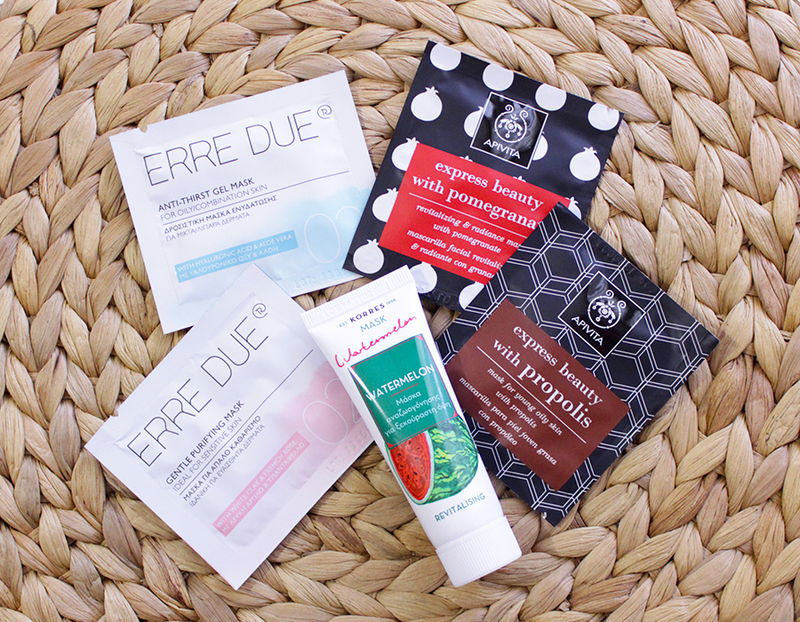 Korres recently came out with a bunch of new face masks, so far I've only tried one, the Watermelon Revitalising Face Mask and I absolutely love it! It has the pink color of a watermelon and the best thing of all is that it actually smells like a watermelon! It's a revitalising mask for immediate moisture and cooling sensation, and when they say cooling sensation they actually mean it! My skin feels like I put my face into a bucket full of ice, but in a good way. It contains watermelon extract that offers antioxidant protection, also it contains sweet almond and macadamia oils for moisturizing properties. 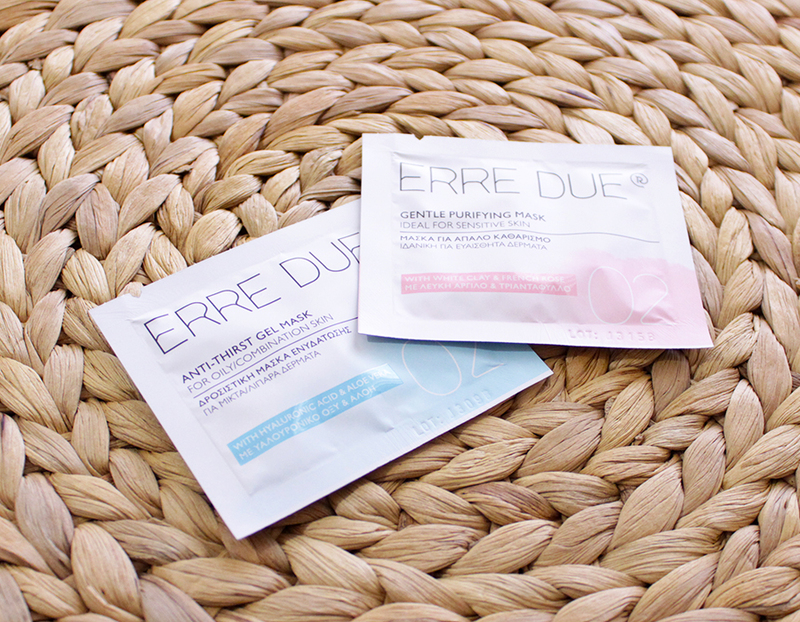 I was happily surprised when a few months ago I found out that Erre Due came out with a full line of face masks. I was lucky enough to try the whole line and two of them made it into my top 5. The Anti-Thirst Gel Mask is a refreshing mask which improves skin's water supplies and offers instant hydration. It has a very thick gel consistency and I have to be very quick when I'm applying it, like the Korres Watermelon mask it leaves a cooling sensation on my skin that feels quite refreshing. It contains hyaluronic acid that boosts skin's elasticity and aloe vera juice which soothes and tones the skin. The Gentle Purifying Mask is the one that I've been using a lot lately, that's because my skin has been very oily and at the same time very sensitive. It's a clay mask but it contains white clay which is way milder than the famous green clay that tends to dry out my skin. The white clay cleans and removes the excess sebum and impurities, it also contains extract and essential oil from french rose flower whcih offers mild astringent and antioxidant action, and bisabolol which soothes and protects the sensitive skin. What are your HG face masks? Let me know! Τελεια αναρτηση, αγαπαω αυτη με το καρπουζι και απο apivita η αγαπημενη μου ειναι η μπλε!!! Η μπλε εχει απιστευτη μυρωδια, σαν καλοκαιρι! Αν ειχα πιο ξηρη επιδερμιδα θα την εβαζα συνεχεια. Κι εγώ την αγάπησα τη μάσκα τζελ της Erre Due!! Πρέπει να δοκιμάσω του Κορρέ και αυτή για λάμψη της Apivita. Αυτη με το ροδι επιβαλλεται! Εχει φοβερα αποτελεσματα στο δερμα. Thanks!! Ειδικα αυτη με λευκη αργυλο θα σου αρεσει γιατι ειναι οτι πρεπει για λιπαρα δερματα. τέλειο ποστ!! !αγαπώ απιβίτα, και τώρα τελευταία άρχισα να δοκιμάζω και από κορέ!! !